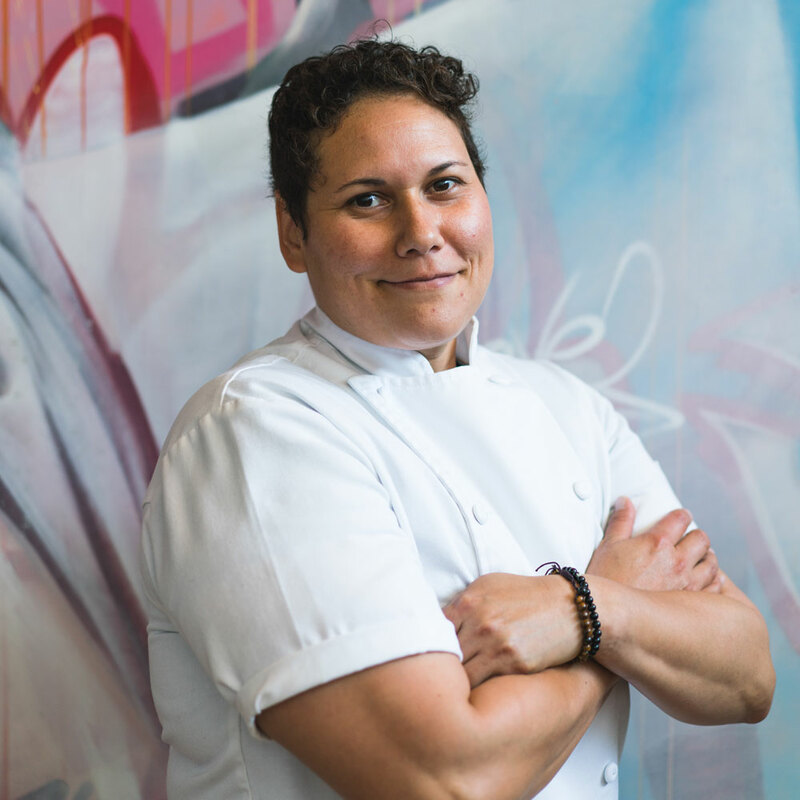 Chef Teresa Montaño connects the flavors of Valencia to Highland Park. The first thing you’ll probably want to know about Otoño, the Spanish restaurant that renowned L.A. chef Teresa Montaño plans to open in June, is that, yes, there will be paella. When Montaño was running Pasadena’s critically acclaimed Ración, she didn’t serve paella, and she never heard the end of it. When she was doing research for Otoño, Montaño traveled to the birthplace of paella: Valencia, Spain. She also marveled at Valencia’s classic architecture and how it was merged with modern street art in the city’s Barrio del Carmen. “It was stunning to see that juxtaposition of old and new,” says Montaño, a chef who wants her food to similarly be an expression of both old and new. Otoño, which has a prime location on what’s recently become an all-star dining corridor in Highland Park, is a Spanish restaurant that’s truly calibrated for L.A. in 2018. It’s the creation of a chef who wants to weave in the diverse flavors that Angelenos enjoy every day. “I love the Hispanic presence in Highland Park, and I hope that stays,” says Montaño, whose menu will include a take on elotes that’s inspired by local street-corn vendors but features Spanish ingredients. Montaño is also excited about making Spanish food with California ingredients and some Asian influences. 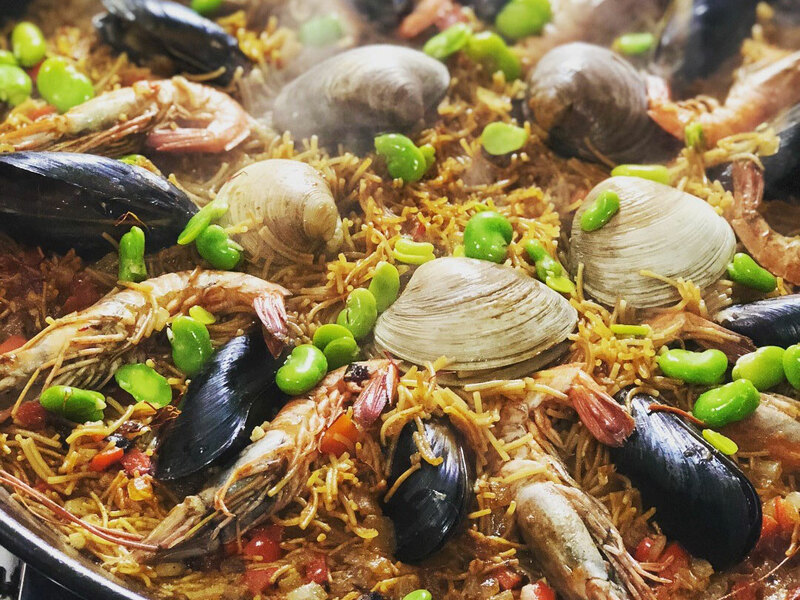 Otoño won’t serve the traditional chicken-and-rabbit paella that’s so popular in Valencia, but Montaño will make her version of a classic seafood paella with lobster stock and local shellfish like Santa Barbara mussels, prawns, and sweet shrimp. For a paella negra with squid ink, Montaño will merge Spanish and Japanese flavors. There will be a vegan paella made with farmers market produce. “The vegetables will always be changing,” Montaño says. 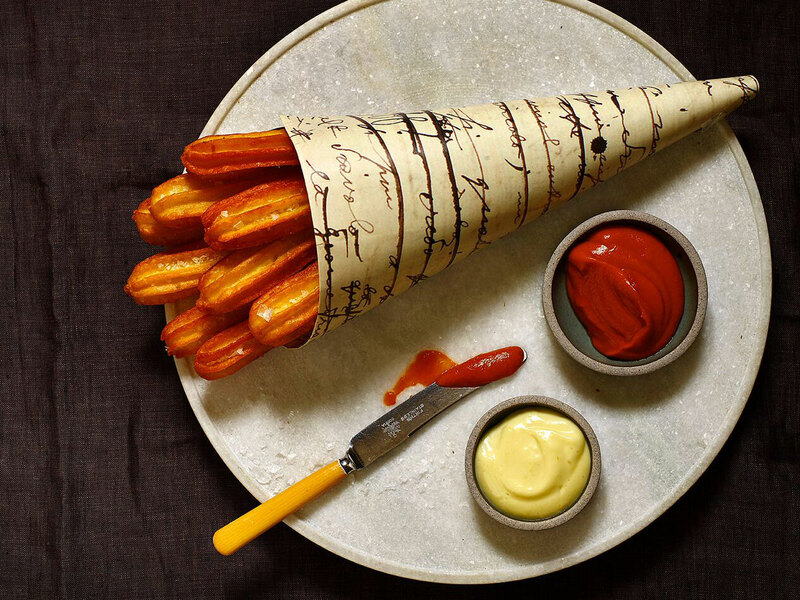 Otoño will also serve L.A.-influenced tapas, including potato churros that are simultaneously a playful reinterpretation of patatas bravas and another nod to Highland Park’s Mexican culture. So the 70-seat Otoño is a restaurant where Montaño is willing to play crowd-pleasing hits, but she’s resolute about playing her riffs on them. Her version of elotes will have Spanish elements like manchego cheese and spicy pimentón. She’ll make croquetas de jamon with local milk and also have mushroom-and-black truffle croquetas with goat’s milk. She’ll use a Japanese charcoal grill to prepare calamares en su tinta, a classic Spanish dish she’s also updating with black-rice crisps. She’ll serve Spanish red mullet (salmonete) over “real thick, buttery, rich tonkotsu” broth made with jamón ibérico bones and fat. She’ll brighten up that fish dish with some cherry tomatoes or some seasonal vegetables. While putting together her menu, she’ll consider her recent visit to Copenhagen, where she ate a mostly plant-based meal at Amass and was impressed by chef Matt Orlando’s commitment to sustainability and zero-waste cooking. She’ll think about Puglia, where she did a couple pop-ups and also cooked alongside Italian grandmothers during a recent visit. In Puglia, she noticed how there were anchovies in a lot of dishes. “It’s my secret weapon because it’s just an umami bomb,” Montaño says of anchovies. Montaño is working on a seafood-heavy menu that will have around 25 to 30 dishes, including gambas al ajillo and Spanish octopus. There won’t be “the gigantic rib eye that everyone has on their menu,” but carnivores can enjoy some vaca vieja New York strip from Mindful Meats, an organic supplier that raises Holsteins with a much longer lifespan than typical beef cattle. The result is intensely beefy meat. Montaño has also found a supplier for fresh ibérico pork that she might use here and there. She’s considering smoked quail and is thinking about different ways to use chicken skins. Montaño says her menu will always be evolving, and part of that will be based on how the neighborhood uses Otoño. Montaño wants Otoño to be an everyday restaurant, so there will be both an early and late-night happy hour. “We’re calling it our siesta hour, and hopefully that will be just super casual, lots of snacks,” she says. There will be Spanish gin-focused cocktails from bar director Josh Suchan and a large selection of wines by the glass from wine director Katie Putterlik. It doesn’t hurt that this is a walkable neighborhood where residents can easily bar-hop. Montaño lives in Highland Park, a couple blocks away from Otoño. Her commute to the Figueroa Street restaurant is six minutes on foot, and she’s been enjoying her life as a carless Angeleno in a neighborhood where so much is changing. Highland Park is home to high-profile new restaurants and bars like Triple Beam Pizza, Checker Hall, HomeState, Mason’s Dumpling Shop, and Blind Barber, all of which are walking distance from Otoño. One of Montaño’s goals is to rally her neighbors and use the collective buying power of all the new restaurants to help the Highland Park farmers market attract more produce vendors. “Also, it’d be cool to set up a little paella stand every week and just cook outside,” she says. Setting that up wouldn’t be too hard, given that the farmers market is just outside Otoño’s back door. Montaño, who was born in New Mexico and is part of a big Hispanic family, understands the power of teamwork in profound ways. She was a serious soccer player for 18 years and she came to L.A. to join Pepperdine University’s soccer team. “I come at my job as a chef very much from the perspective of an athlete, teamwork and discipline and all those things that I picked up throughout my soccer career from age 4 to 22,” she says. Montaño is a chef who deeply considers the past when she thinks about the kind of future she wants to create. This applies to being a strong female leader who’s building “a safe, nurturing environment where employees can really thrive and have the tools they need to grow.” It also applies to just cooking what she wants and realizing that being an L.A. chef means you can and should break boundaries. And, of course, it applies to understanding what makes customers happy. It’s nice, Montaño says, to serve paella in a 1920s building with 20-foot brick walls and massive metal pillars. There’s a sense of place here, in a restaurant with vintage tin tiles and lots of copper but also a modern, graffiti-laden mural Montaño commissioned from Valencia street-artist duo PichiAvo. There’s also a sense of whimsy here as Montaño does things like use a Japanese base to make paella.